The 5L40-E 5-speed automatic transmission is made by General Motors. It is electronically controlled, and has been fitted to a number of US vehicles, but is predominately found in BMWs in the UK. The shifting in the 5L40-E automatic transmission is controlled by a series of springs that are meant to “cushion” the shift and make for a smooth ride. Unfortunately, these springs can break. Broken accumulator springs should be replaced as soon as possible, as repeated harsh shifting will greatly reduce the life of the affected clutches. A common fault with the 5L40-E, particularly on larger vehicles such as the Ranger Rover, is for the output shaft spline to wear down to the point where it no longer functions. In cases like this, the vehicle may feel as though it is slipping, and a metallic noise will issue from the middle of the vehicle when an attempt to drive it is made. The only fix for this is to replace the output shaft. 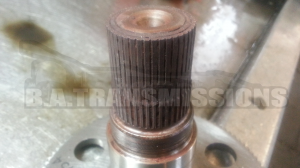 The output shaft of a 5L40e automatic transmission from an L322 Range Rover can wear, causing a complete or partial failure of transfer of drive from the transmission to the transfer box. The 5L40-E automatic transmission will begin to slip and, in cases where the problem is not found early enough, lose drive entirely. The problem is caused by the lockup solenoid inside the transmission failing, which causes the torque converter to fail in turn. 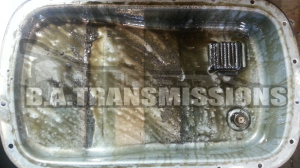 Unfortunately, the problem is rarely caught in time, and the transmission will nearly always require a full overhaul. When a 5L40 automatic transmission suffers a torque converter failure, the sump will likely be full of metal. This list should be used as a guide only, there may be exceptions (cross-over models, for example) where a vehicle on this list is not running a 5L40-E automatic transmission, and there may be vehicles not on the list that are.